Entree recipes in the United States typically never include bananas in them. Banana recipes are reserved for delicious desserts, pies, cakes, breads and salads. In other countries, cooks incorporate bananas in many of their traditional preparations of entrees. The word “banana” usually refers to small sweet fruit dessert bananas and this is why we make so many delicious desserts with bananas as a primary ingredient. If you have never made entre recipes and incorporated bananas in them, you must try it. For making sweets, it is better to use bananas which are overripe. For making entrees, I am not concerned about using really ripe bananas. As you know, the riper they are, the sweeter they are. For entrees, I like using the less sweet bananas. It is amazing how the flavor of bananas combines so well with spices and other ingredients often used in entrees. This entree recipe has a delicious black bean mixture to serve with the browned banana slices. Cut peeled bananas in half lengthwise and then cut in half across making quarters. 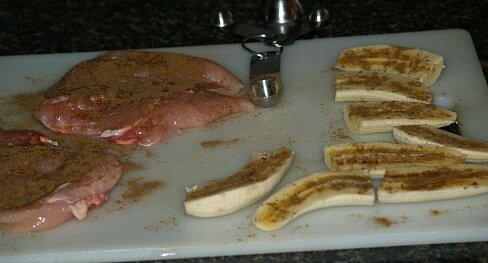 Sprinkle bananas with ½ teaspoon cumin; sprinkle chicken with remaining cumin. Heat oil in a large skillet over medium high heat; brown bananas on both sides and place on serving platter. Cook chicken in same skillet on both sides until done; move chicken to the serving platter and keep warm. Add bell pepper, green onion, chopped tomato and garlic to the skillet; stir constantly until tender crisp. Add beans, pepper, oregano and chicken broth; stir and heat thoroughly. Season chicken breasts with salt on both sides; melt butter in skillet and brown chicken on both sides. Sprinkle ginger and half of coconut over the chicken breasts; add cream. Over low heat cover and cook 10 minutes or until chicken is done. 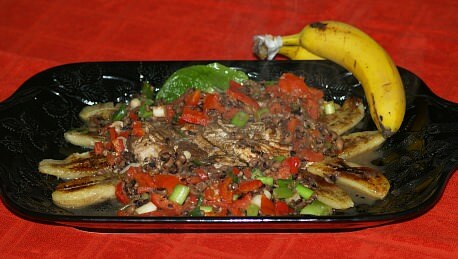 Arrange chicken and fruit in shallow serving platter; pour warm sauce over top. This makes a beautiful presentation for an entree recipe. Combine potato chips, Parmesan cheese and thyme in a shallow dish. Dip fish in milk and then dredge in potato chip mixture. Place fish on greased baking sheet in a single layer; bake 10 minutes or until fish flakes. Combine all ingredients and blend well; cover and chill for 2 hours before serving. Like I said before, it is not often that bananas are used in entree recipes. I have made many sweetened ham glazes with fruit such as apples and cherries before so why not bananas. This has a wonderful flavor to go with ham which counteracts the saltiness of the meat. Heat over medium brown sugar, butter and vinegar in a large skillet until sugar is melted stirring frequently. Add ham slice to skillet and cook 5 minutes on each side. With spatula arrange ham slice on platter and keep warm. Remove skillet from heat and cut bananas in 1 inch chunks into skillet; cook over medium heat basting the bananas. Spoon bananas around ham slice on platter; serve immediately. To me this South African dish is an acquired taste. As you can see this is not typical of banana recipes. As one of the few entrée recipes I have, the flavors come from many different ingredients. We are all familiar with ground meat, onion, garlic and tomatoes in a recipe, but then think about the added flavors of sugar and vinegar to make a sweet sour taste. It is then spiced with curry and turmeric; then top it off with fruit and nuts and finished with eggs on the top. This may not sound good entree recipe to you but many people love this dish and relate the flavor to many of the Indian dishes. Soak bread in tomatoes and juice. Brown ground meat, garlic and onions; add sugar, curry, turmeric, vinegar and salt. Add bread mixture to meat mixture and blend well. Add bananas, apples, almonds and raisins; mix well. Place mixture in a casserole baking dish and pat down until level. Combine and mix eggs with milk; pour over meat mixture. Bake about 40 minutes; serve with rice and chutney. This is a very flavorful entree recipe with bananas, parsley and cayenne pepper. Add pork chops to skillet and cook 10 to 12 minutes on each side depending on thickness. Five minutes before the chops are cooked peel the bananas and cut in half lengthwise. Add to the skillet and sprinkle with salt, pepper and cayenne. Lift out the pork chops and bananas; arrange on a warmed platter; garnish with lemon and parsley. Stir flour into pan juices; add broth gradually while stirring; simmer about 3 minutes. Pour gravy into small serving dish; serve with plain boiled rice. Ry this tasty Caribbean entree recipe. Combine coriander, lemon pepper, nutmeg, allspice, salt and pepper; set aside. Coat a large skillet with cooking spray; place over medium heat until hot. Dredge fish in flour and place in hot skillet; sprinkle fillets with half of spice mixture. Cook until browned, turn fillets over and sprinkle other side with remaining spice mixture. Cook until other sides is browned; place banana slices over the fish; sprinkle with green onion. Add coconut milk and cook until fish flakes easily when tested with a fork. Remove from heat and add rum to skillet; cover and let stand 5 minutes. Entrée recipes made with bananas are often seasoned with curry. Heat oil in a large heavy skillet over high heat. Add beef; break it up with a spoon cooking until browned and done. Add onion, garlic and curry powder; stir and cook about 4 minutes. Stir in tomato mixture and lemon juice; season with salt and pepper. With a sharp knife slice bananas lengthwise just through the top skin. Pull skin apart slightly; stuff each banana with the curried beef. Arrange bananas in roasting dish; cover dish with foil. Bake about 25 minutes or until bananas are tender and thoroughly heated. Sprinkle with the red pepper and serve. Serves 6. Many delicious entrée recipes include bananas adding an unique taste. Combine onions, garlic and oil in microwave safe casserole dish. Microwave on HIGH 2 to 3 minutes; add pork and rice to dish. Measure juice from tomatoes into bowl; crumble bouillon cup into bowl. Add enough water to make 2 cups; add liquid to the casserole dish. Chop the tomatoes into dish; add paprika, cinnamon, salt and pepper. Cover dish with lid; cook on MEDIUM for 20 minutes. Let mixture stand 5 minutes for rice to absorb the liquid. Peel and slice bananas; stir bananas and peanuts into the casserole.